Our solar system has its own rhythms. As our planet orbits and interacts with other planets, all the cosmic energies influence each other. That means every day has a unique flow of energy. 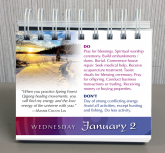 With this beautifully designed, U.S.-made calendar, you have the key to understanding those flows. The key to a year of energy "dos" and "don'ts". Knowing the energy of the future, you can now be your own energy consultant and plan ahead for all of life's most important events. No more need to hire an expert – you are the expert! My clients and friends often come to me for energy readings on their important life events, such as their wedding day, the day for building or buying a house, signing an important business contract, etc., because they understand the importance of daily energy, and whether or not it will support the critical activities they are taking part in that day. 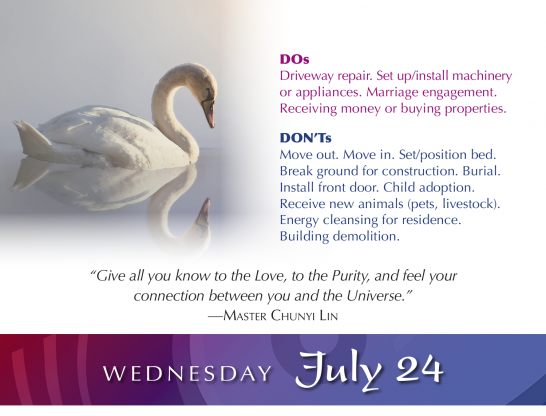 In my meditation, I always read the energy of the day requested. I also verify my reading results with the energy almanac. This daily energy almanac came from thousands of years of energy observations, with everyday being different, and it repeats just once every 60 years. Staying true to our ancestors' wisdom, the translations in this almanac are authentic. 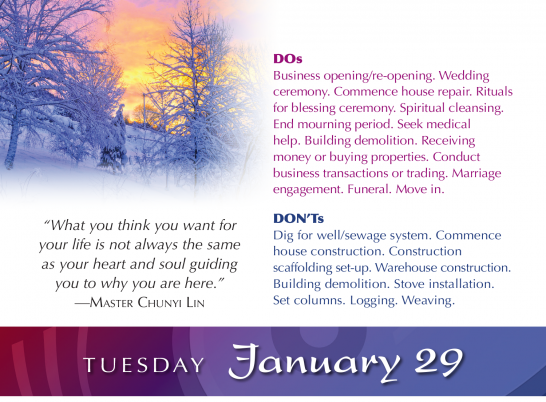 You will find the daily energy calendar bringing to you the wisdom of the past, with the practicality of the modern day. 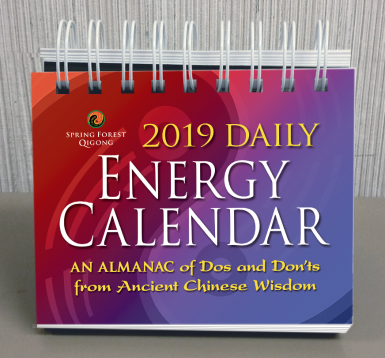 I am so happy that Spring Forest Qigong finally developed this daily energy calendar, so my friends can have a quick reference for themselves. Now you, too, can plan your important life events ahead of time with confidence. Wisdom of the Past. Practicality of the Present. Are you the head of household? Are you the one making family decisions? It is incredibly empowering to know the energy and energy flow. Now you have this wisdom right at your desk. Your friends and family will be so impressed by what you know. Give them their daily readings and help them plan for significant life events. No need to put a nail in the wall. Instead, keep this calendar on your desk or kitchen island so you can consult it any time. Save the time and money you would spend on an energy consultant. Become your own energy expert! Plan ahead with this guide and find the best supporting energy for what you are called upon to do! Powerful ancient wisdom applies to modern people, too! Practical essentials for enhancing life activities. Full-color, printed in the U.S.A.
Get the Calendar You Will ACTUALLY use! Copyright © 2018 Spring Forest Qigong. All Rights Reserved.